What is ear wax and why is it a problem? If you're experiencing discomfort, pain or itching in your ears, it may be because you have a build-up of ear wax. Ear wax, or cerumen, is secreted into your ear canal by the sebaceous and apocrine glands in your outer ear. It is usually a brown, yellow or grey colour, and sticky and moist in texture. It might sound yucky, but ear wax is perfectly normal – in fact, it helps protect against bacteria and contributes to clean, healthy ears. It works by slowly making its way out of your ear canal, taking dirt with it. Yes, we have self-cleaning ears. What problems can ear wax cause? Ear wax is a sign of healthy ears, and nothing to worry about. However, in some cases, our ears can produce too much wax and cause blockages. This can be the result of improper care: using cotton buds, for example (to find out why that’s a bad idea, read this). If you're experiencing any of these symptoms and think you may have a problematic build-up of ear wax, book an ear wax removal appointment at Leightons now. Call 0800 40 20 20 or book online. Ear wax removal is now available at all branches of Leightons Opticians & Hearing Care. Of course, you don’t want anyone poking about in your ears. That’s why all our trained and experienced audiologists are registered with the HCPC (Health & Care Professions Council) and are members of the British Society of Hearing Aid Audiologists. 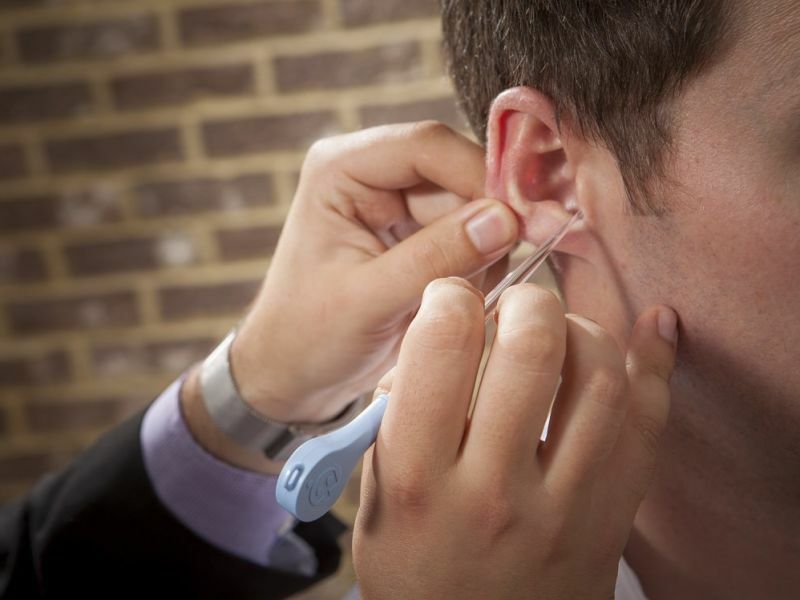 Leightons Opticians & Hearing Care offers an expert ear wax removal service.